As the Christmas season approaches, I've been reminded of the amazing miracle that Jesus' birth in the little town of Bethlehem really was. The youth director that I serve under at Sharptown church was describing the scene of our Messiah's birth and all that led up to it, and every detail that had to be in place for the Old Testament prophecy to be fulfilled. He challenged the youth leaders to take a look at their own lives at times things had to fall into place at the exact right time for God's perfect plan to take action. God sure knew what he was doing with me this past year! I'm about to embark on an amazing (and hard) adventure that, to me, seems like a miracle. Like I said in my last post, I'm going to be a nurse! I didn't know at the time how I was going to become a nurse, but I knew it was going to happen. The miraculous timing of God got me to the place I am today and I'm so excited to start another adventure in just 2 short weeks. After my graduation from Asbury University in May 2013, I was planning on taking a year to travel the world. I had committed to the World Race, an 11 month mission trip to 11 different countries all over the world through Adventures In Missions. I would be raising $15,000 to support my year abroad, and to do so I was planning on staying in Kentucky for half the summer and then coming home to New Jersey to finish up fund raising and spending time with family before I would leave. My lovely friend Laura and her wonderful parents offered me a room at their house so I could finish up the necessary classes for nursing school and work on fund raising in the area. It just so happens that Laura's dad is no ordinary dad. He is the brother of my pastor at Sharptown Church in NJ, a fellow Delanco Camp attender and alumni of Asbury University, as well as a very influential leader in the Methodist denomination. After a week of living in their home and doing some extra research, I made the decision to back out of the World Race. I was bummed to say the least, but even more than that, I was back to square one. I had no plan other than staying in Kentucky until my classes finished up and then moving back to NJ. Now Mr. Smith and I had been playing this game he liked to call "three questions." It's quite simple; he would ask me three questions and I would ask him three questions. We learned a lot about each other and I certainly learned a lot about theology! I remember out of the blue (I don't even think it was during one of our "three questions") he asked me if I would consider applying to Duke University. I had not considered it, and for a good reason; only smart people go to schools like Duke! He told me I should apply, and he helped me along with the process. I applied for nursing school at Duke the day of the deadline. That was the end of that for a while. I didn't have much hope, but I was happy to have tried. When it came time to move back home to NJ, I still had no idea what I would be doing. My plan was to go back to babysitting everyday for the summer, go to Delanco, and try to find a job until I could apply to more schools for the following year. 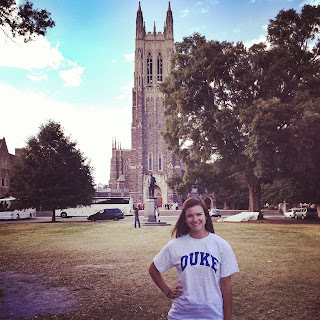 I was taken by surprise when I received the email that I had been ACCEPTED into the School of Nursing at Duke University. I seriously thought they sent me the wrong email. I waited to tell anyone for about a day because I was sure they made a mistake. Long story short, I made the decision to go to Duke in September and I couldn't be any more excited. When I look back at all that happened it seems to be nothing less than a miracle. I have a hard time believing I would be where I am today if I hadn't traveled to Kenya, been rejected from PT school, committed to the World Race, moved in with the Smith family, and applied to the school that only smart people go to. It doesn't always take good grades and lots of experience to get where you're going; sometimes all it really takes is surrender to the Lord Almighty and faith that He knows you better than you know yourself. Praise God! I'm going to be a Duke nurse!